A Calgary obstetrics and gynecology clinic has received some backlash after posting a sign at its entrance asking patients not to bring unvaccinated children inside, but Dr. Fiona Mattatall says she has no plans to take it down. Mattatall and four other physicians who work at the clinic decided to put up the sign after the recent measles case in Calgary. "We met and decided that we wanted to protect our patients from exposure because we have patients who are at-risk," she told the Calgary Eyeopener. Pregnant women "have far worse outcomes than other adult women" if they get sick with measles, she said. The policy, itself, isn't new — but the sign is. For nearly a decade, the clinic — which doesn't treat children, specifically — has been asking new patients to refrain from bringing their children to appointments if the kids haven't been vaccinated against preventable diseases. Mattatall said the decision was made in the wake of the H1N1 influenza pandemic of 2009. 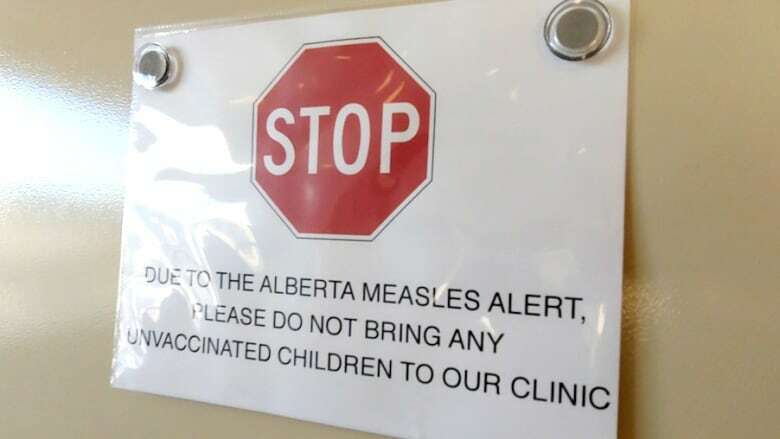 She said the sign was put up this week, after Alberta Health Services issued a special warning due to a person with a lab-confirmed case of measles who visited nearly a dozen public locations in Calgary and Cochrane. After an article about their decision was published this week in the Globe and Mail, Mattatall said a woman called the clinic and was "very abusive" toward staff. The woman told staff "she was going to bring her unvaccinated children and leave them in our waiting room to expose other patients," Mattatall said. Still, the policy hasn't changed. Mattatall hasn't heard of other clinics doing the same thing but has heard words of encouragement from colleagues. "I've had other physicians reach out to me, thanking us for doing this," she said. "Some clinics aren't in a position where they can do this, because the unvaccinated children may be their patients — and we can't refuse care to patients. But we're in a unique position because we do not look after children specifically in our clinic, so they are not essential to the care of our patients."